The importance of talking to patients in their language, not medical terminology. Patients see the words “veneers”, “endo”, and “Cerac” in many (too many) dental office marketing on the Internet and in print. And as dentists, we are expecting patients to know what these mean to self-diagnose their dental needs before they call the office for an appointment. I blame this on the pharmaceutical companies. Do you remember a few years back when Allegra came out? After they aired their commercial, which showed people happy and dancing around a field and everybody rushed to the doctor saying they were depressed and needed Allegra. Which we all know has nothing to do with depression, but it’s for your allergies. These major drug companies were expecting patients to self-diagnose their needs and run to their doctor requesting that particular drug. Recently while strolling through a local department store, I came across something I hadn’t seen before and I thought it was brilliant. And because in my brain everything goes back to helping dentists somehow, I wondered why more dentists were using this method in their advertising. It was a wall of these packages that all said ‘Help me I have….’. 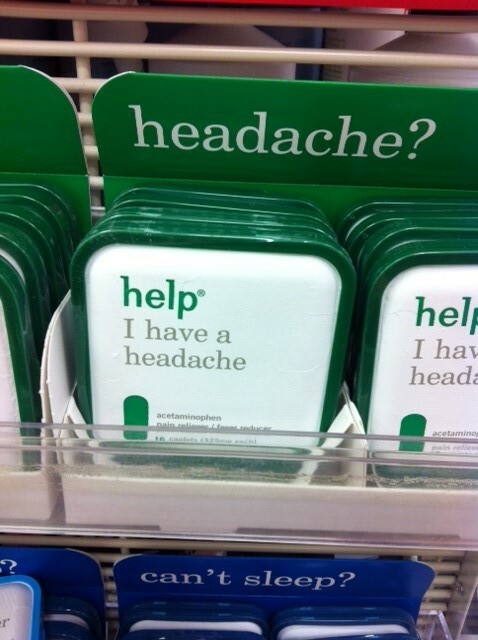 ‘Help me I have a headache’, ‘Help me I have heartburn’, and so on. And all you had to do was pick the drug packaging that matched your symptoms…no self-diagnosis or needing to know what drug treats what condition. Plain and simple. No big long description of the problem, and what caused it, but a plain solution to their problem in a way they cared about. It’s about helping them connect the dots of their problem and how you can give them the solution. You are making it easy for them to realize you are the person to ‘give their loose fitting dentures’, not telling them all the fancy procedures you are qualified to do. And if you start applying this simple ‘Help me’ method I think you will see more patients finding it easier to say, ‘Yes’ to accepting treatment. Your office is sending messages to your patients (especially first timers), but is it a good one? I am always giving tips and strategies for marketing and getting more patients but this week’s I’m talking about something a little less conventional. It’s something occurring every day and its right under your nose, but it’s not really being addressed. And it is costing you patients!!!! This ties into marketing in a really big way, because your office is sending out a lot of messages to your patients under the radar, but that doesn’t always mean it’s a good message. Think about your house for a second, you walk through your house countless times each day and you think it’s clean. Until you have a visitor coming. You get a call from an old friend or your mother-in-law saying they are coming to stay a few days and you look around your house and realize it maybe isn’t as clean as you thought. That never-ending stack of mail by the front door, or everyone’s shoes piled by the garage. These are all things you walk past every day but they aren’t a big deal to you. But if you’re having company over, you probably want these things tidied up. The same applies to your office. You probably walk through your office 100 times a day, but when you’re walking through you have your business goggles on. You’re in work-mode, and not paying attention to everything lying around like the magazine in the reception area. But you need to start paying attention, every day. Designate a specific person to do a walk-through every morning and survey your entire building with ‘patient goggles’ on. Treat it with the same thinking as you do when you’re having company over to your house. Going all along the patient path, even starting with the parking lot and working your way all the back to the procedure rooms. If your parking lot has a lot of trash laying around, that sends a certain signal to your patients, especially your first-time ones. Now, maybe you don’t have surgery books laying around, but we all something that could be tidied up. Make sure to change out your magazines often, make sure they are ripped or dog-eared. Are there any little scuffs on the walls or flooring that need fixed? These are all simple quick changes that can go a long way for your patient message. Three tips you need to know before placing a marketing ad. When you are in any type of business, it’s important to know everything about your audience and be crystal clear who you’re trying to attract. In your case, your ‘audience’ is your dental patients, but I want to you take it a step further and know your ideal niche patient. You may think a patient is a patient and they are all one big group, but that’s hardly the case. I bet if you looked at them in detail, they could be placed into a handful of individual groups. And figuring out those categories is the first step you need to take to know your audience. Once you have your patients grouped in these categories, it acts as a blueprint and allows you to map out a laser-focused marketing sequence to that specific niche patient. A great example of this is the newspaper and yellow page ads. This has dramatically changed over the last several years. Before all you needed was your name, phone number, and address, but that doesn’t work anymore. Then offices started adding ‘we accept insurance’. And more recently starting listing what credit cards they accept (which you should never do!). These are things that are just assumed. So you have to be more specific in your marketing ads and break it down. Every audience is different in what they are searching for and respond to, so when you’re creating these ads it’s important that you only market for one thing at a time. Which is why I broke it down into three very important steps you need to cover when creating a marketing piece. First, you have to be laser focused. Every marketing piece you do doesn’t have to be all things to all people. You can have different demographics of patients you are bringing each, but each marketing piece needs to be directed to only one group at a time. So determine your audience and be laser-focused on them. Which leads us to step two. Whether you are creating a marketing piece for your patients or speaking to them in the office you need to let them know you speak their language. If they are having a dental issue, they aren’t using words like, ‘I need an implant’, they are saying, ‘I’m missing a tooth’. So, you have to use the words they know and are using to describe their problems. In this week’s video, I give you three very important tips you need to cover when creating a marketing piece. Is it laser focused to that target patient? Are you speaking their language? And are you making them feel like you care about them? Take a few minutes to watch the video, where I break down each point and give you easy to implement steps to make sure your next marketing piece gets the best results it possibly can. So, you have to speak their language. The last part is often overlooked but it is equally as important as the previous steps and that is making a connection with your patients. They want to feel like you really know them and care about them. When they see an ad from you or are looking at your website you want them to think to themselves, ‘This dentist gets me and my needs’. It’s about making a connection with your patients, human to human, and making them feel comfortable in knowing you have their best interest in mind. If you keep these three steps in mind when planning your marketing you will start to higher patient response to your ads.